The Annual Uncirculated Dollar Coin Set and US Mint Silver Proof Set were again the leaders with a 8.12 percent and 4.90 percent increase in sales, according to the latest silver coin sales stats released by the U.S. Mint. That contrasts to last week sales increases of 4.3 percent and 2.6 percent. The proof set sales surged up by 29,000. Bald Eagle commemorative coin sales, which officially end on December 12, 2008 at 5:00 PM (ET), hovered between 1 and 1.5 percent. 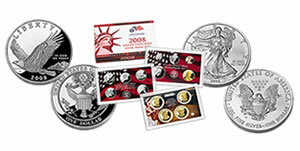 Unlike last week, the 50 State Quarters Silver Proof Set figures changed, up 2.9 percent. * The print products with an asterisk have been sold out. For more information regarding each of the above coins, to include their prices and U.S. Mint product page links, view the Silver Coins Today page United States Mint Silver Coins. Visit the CoinNews collector tool page U.S. Mint Collector Bullion Coin Prices, Premiums and Sales Figures for updated tables of common gold and platinum coin stats. This tool can also help locate the better priced and more scarce coins. Additionally, NumisMaster has a breakdown of the latest sales figures for most Mint coins at Mint Stats: Bald Eagle American Legacy Set Joins List.